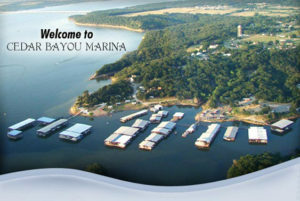 Beautiful Lake Texoma Marina Resorts are full service facilities. These Lake Texoma fishing camps have fuel docks, boat launch facilities, fish cleaning stations, ships stores, boat storage areas and slip rentals. Many have cafes or restaurants right on the water with beautiful views of Lake Texoma. Often referred to as “fishing camps”, these marinas have cabin rentals and offer fishing guide services. Want to tour the lake or cruise over to the islands for an afternoon of fun in the sun? Ask about boat rentals, charter services and cruises. Many marinas also rent personal water craft, sail boats, canoes, kayaks and stand up paddle boarding equipment. 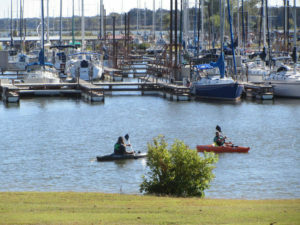 Boat Dealers are located at several of the Lake Texoma marinas with sales and service for water craft from canoes and kayaks, fishing boats, and yachts you might find on the open seas. Several of the marinas have sailboat slips and offer repair and maintenance services as well. Many of the Lake Texoma marinas offer dockominiums and one marina has an entire subdivision of “floating homes”. Now that’s about as close to staying “on the water” as you can get! Check out the Lake Texoma map of marina below for locations. Great fun, charming atmosphere and lots of things to do await you at Cedar Mills Marina and Resort on beautiful Lake Texoma. 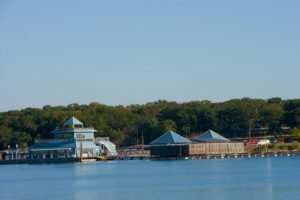 Cedar Mills Marina, one of the largest marinas on Lake Texoma, is located on the west end of Lake Texoma just off US-377 in Gordonville, Texas.